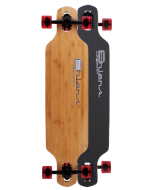 100% bamboo pintail deck: This is awesome for your everyday cruise. The feel of the board is sturdy with a handful of smoothness. The is deck is similar to the 44" x 10" bamboo pintail except for the deck size. Grip Tape: All bamboo pintails come with clear sugar spray grip. The 70mm 78a are a little larger in diameter and better for rockier areas like rocky parking lots and rougher asphalt.